An artist in Italy hand carved statues of Saint Peter and Saint Paul for the Church of St. Agnes. Each statue weighed approximately 1,500 pounds and was 10 feet 3 inches high. The statues were shipped to the United States and stored in Alltech’s shop until they could be installed in the Church. 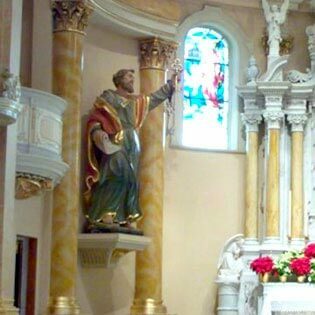 The Parish wanted the statues elevated at the sides of the altar, but did not want the statues supported from the altar floor. 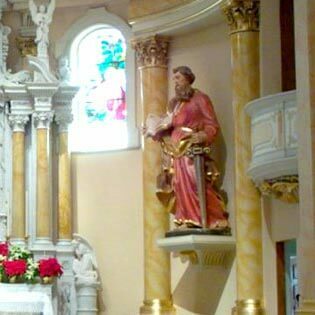 Alltech was contracted to design and install a method of supporting the statues, transport the statues to St. Agnes, and rig the statues into place at the sides of the altar. A hallway with stone masonry walls on both sides encircles the altar. Alltech designed and installed cantilevered platforms and embedded the supporting beams into the masonry walls. The statues were then transferred from Alltech’s shop on open trailers, and a crane was used to set the statues at the top step of the entrance to the Church. The statues were then moved inside the Church to the altar, and rigged into place.